The Hart Senate Office Building is the third office structure designed and built to serve the United States Senate. Located northeast of the Capitol on a site bounded by Constitution Avenue, C Street, First Street, and Second Street N.E., it adjoins the Dirksen Senate Office Building. Northeast of the Capitol, adjoining the Dirksen Senate Office Building, site bounded by Constitution Ave., Second St., First St., and C St., N.E. While the design of the Senate's newest building scrupulously avoided classical ornamentation, the exterior nonetheless subtly recalls the regular rhythms and deep shadows of columnar buildings. It was intended to be a graceful background building that, despite its size, would call little attention to itself. On the inside the architects managed to balance the desire for modesty with the need to use permanent and therefore costly materials — mainly marble and bronze. The central atrium provides a gathering and organizing space, and gives inside offices access to abundant natural light. The building added more than a million square feet to the Senate's inventory of office and support space. There are 50 suites, which range in size from 4,000 to 6,000 square feet. A public hearing room was equipped for the electronic and written press, while facilities for food service, parking, physical fitness, police, mail, and maintenance were also provided. The most novel aspect of the plan was its flexible offices. All the older office buildings provided offices in rooms strung along one side of a corridor, putting a considerable distance between staff members. For the Hart Building, the architect devised a totally new scheme. Each suite would occupy an envelope of space on two floors. The senator's personal office would have a ceiling height of sixteen feet, and staff areas with ceilings eight and a half feet high would be grouped around it. Within the staff space, partitions could be rearranged anywhere along a five-foot grid. Each office could be laid out with ease according to the management practices of an individual senator. View of the Hart Building atrium. The Mountains and Clouds sculpture by Alexander Calder, creator of the mobile, was installed in the building's atrium in 1986. The matte black aluminum clouds, the largest of which weighs one ton, were suspended from the roof, revolving above the 39-ton steel mountains. 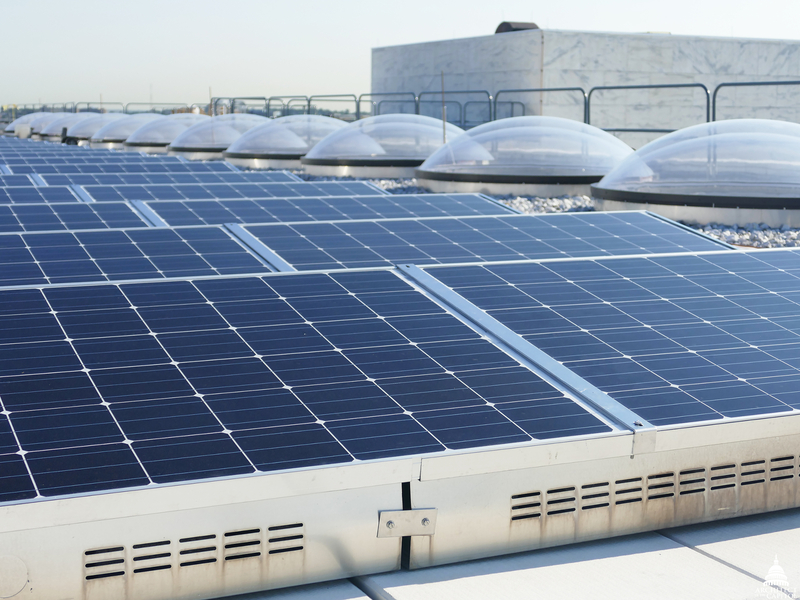 The Hart Building solar panel system, dedicated in 2015, is one of the largest federal systems in the Washington, D.C. area. The system furthers the Architect of the Capitol's (AOC) commitment to sustainable and cost-efficient energy reduction measures. 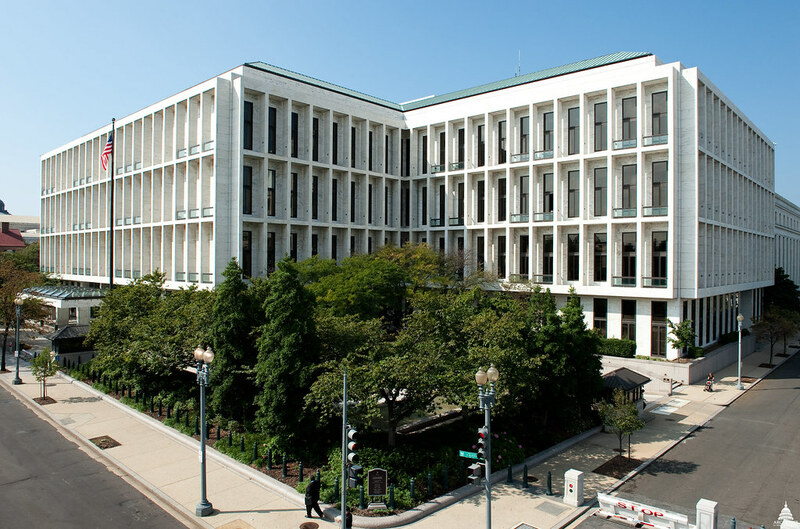 The AOC Senate Superintendent's Office is responsible for the day-to-day structural, mechanical and domestic care of the Senate Office Buildings. Earlier efforts to provide space for the Senate had included the construction of the Russell Building and the Dirksen Building. By 1967, the Senate began to experience a strain on its existing office facilities and initiated the process that led to the creation of the Hart Building. In 1972, the Senate Committee on Rules and Administration asked the Architect of the Capitol to survey the space occupied by senators and staff and report on their work environment. 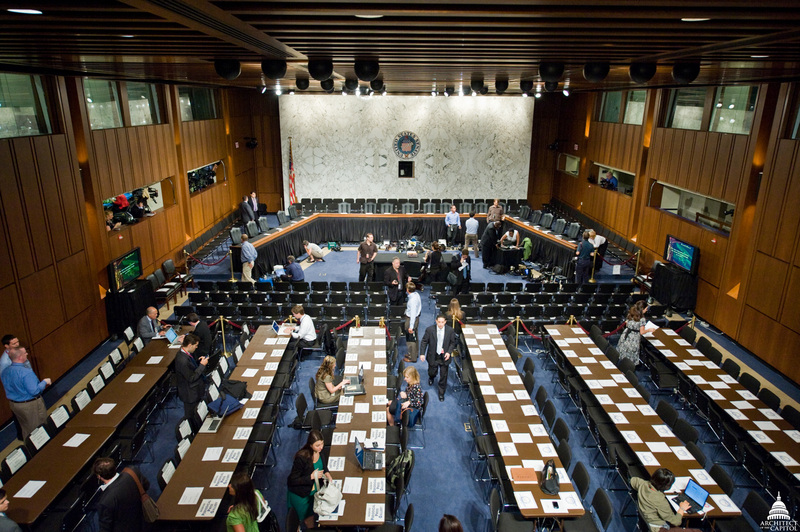 In the decade and a half since the Dirksen Building had opened, the number of persons working for the Senate had grown from 2,500 to 7,000. The Senate Office Building Commission authorized Architect of the Capitol George M. White to commission John Carl Warnecke & Associates to prepare studies. In addition to satisfying space and design requirements, the architects were required to preserve the neighboring 19th-century Belmont House. 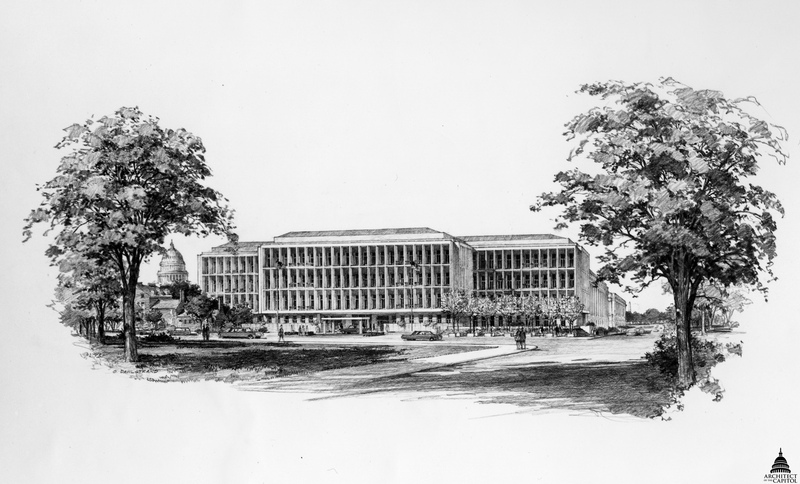 Rendering of the Hart Senate Office Building by architect John Carl Warnecke. 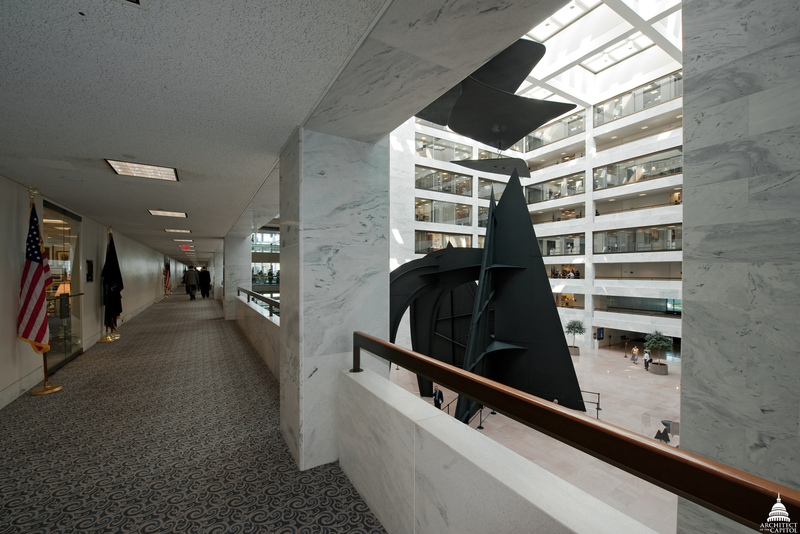 On August 8, 1974, the Senate Office Building Commission and the Senate Committee on Public Works approved a proposed nine-story "extension" to the Dirksen Senate Office Building. The design included suites for 50 senators, with over one million square feet of interior space, including three floors of garage and service facilities, eight floors of offices, and a mechanical equipment floor at the top. A central atrium provides offices and corridors with light in an energy-efficient manner. To allow flexible office space design, Warnecke introduced a two-story "duplex suite," consisting of a Senator's office with traditional 16-foot ceilings and two staff levels that can be easily rearranged by the use of demountable partitions. 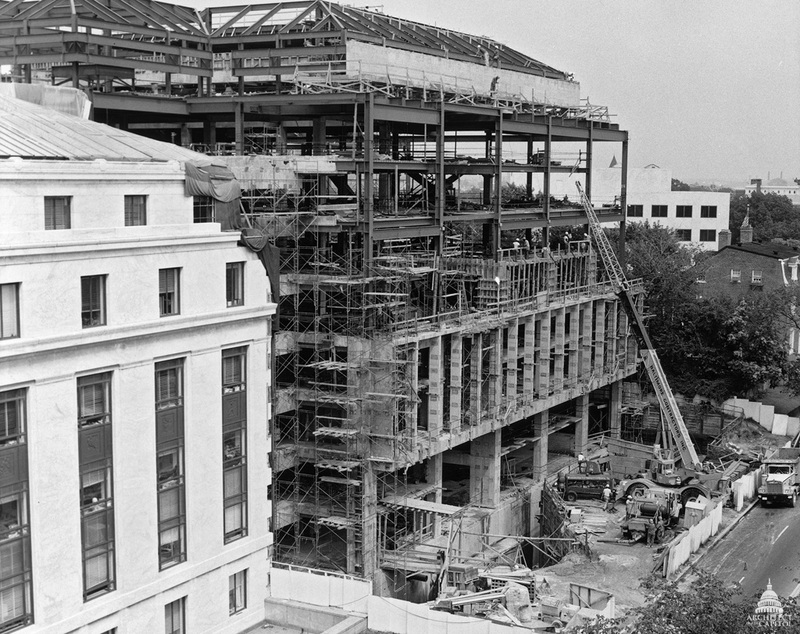 Construction of the Hart Senate Office Building in August 1979. The first construction contract was awarded on May 20, 1975, excavation began in December 1975 and the building was named in honor of former Senator Philip A. Hart in August 1976. The first occupant, Majority Leader Howard H. Baker, moved into the building in November 1982.